All new church lighting models provided by Church Interiors are available with Fluorescent or LED ballasts. Our lighting systems help you to save on your electric bill and increase the lighting capacity in your sanctuary by 400-500%. Our models require less maintenance than others, as each bulb has a life of 10 years. All available models are dimmable and we offer option of lighting packages that have dimmable LED modules. 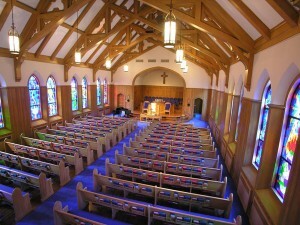 LED church lighting produces less heat, wattage, and maintenance. We also offer the option of LED recessed can lighting for your sanctuary.